One of the many prerequisites to receiving a permit to mine a certain area is that the company must outline how it plans to leave the land once mining is complete. For those sites where developable land is not needed for some specific future purpose, the company must reconstruct the area similar to its original appearance. This is a rigorously engineered and highly technical project, but one that the industry takes great pride in as mining employees live and work in the same area as the former mine site. In many cases, the mountain is reconstructed and streams, ponds and wetlands are created. A variety of grasses and millions of trees are planted on these sites. Once mining is completed in a particular section of a surface mine or even when an underground mine ends production, crews immediately move in and begin the process of cleaning up old equipment, rebuilding mountainside and restore the aesthetic and environmental quality of the area. 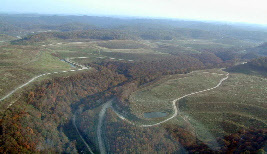 For former surface mines that means re-sculpting the mine site and restoring the original appearance. The same is true of former underground mine sites. The accesses are sealed and the site restored to its former condition. Water quality is monitored throughout the mining process and steps taken to treat any streams and preserve the biology. Once restoration is begun, this process enters a new phase as well, with long-term treatment facilities put in place to make sure there is no environmental harm to the area or downstream waters. One of the common complaints about former surface mine lands is that large and hardwood trees cannot grow due to some perceived lack of top soil. As has been shown in other portions of this publication, this is not true. In fact, properly prepared, former surface mine lands are very good for the growth of such trees and are even being used to restore the American Chestnut tree to its former native range. As for topsoil., most if not all the original topsoil from a surface site is removed, segregated and kept in storage for use in restoring the area. One of the preferred reclamation uses today – one that has been strongly encouraged by governmental agencies and environmental groups – is leaving the land in a condition that will attract and enhance usage by fish and wildlife. The Appalachian region has seen a resurgence of wildlife on and around former mine sites, as they provide open spaces and sources of food and water. It was on reclaimed land where over 150 mountain elk were released recently in Kentucky and wild horses have been seen in Logan County, West Virginia. As a practical matter, this could not have occurred other than on reclaimed mine sites. The mining industry is committed to environmental stewardship and takes its job seriously. 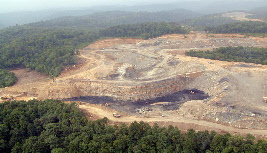 Many governmental and environmental groups, such as the West Virginia Department of Environmental Protection, Ducks Unlimited and the Wild Turkey Federation, annually review and nominate coal company reclamation projects for special recognition. These are highly coveted awards and something for which everyone in the industry strives.